President Donald Trump went on another tweet-storm Wednesday, this time sharing a meme showing several prominent Democrats, including Barack Obama and Bill and Hillary Clinton, in prison for treason. The audacious tweet followed yet another Twitter post from Trump attacking special counsel Robert Mueller‘s Russia investigation, which he compared to the “Joseph McCarthy Era” of anti-communist sentiment. 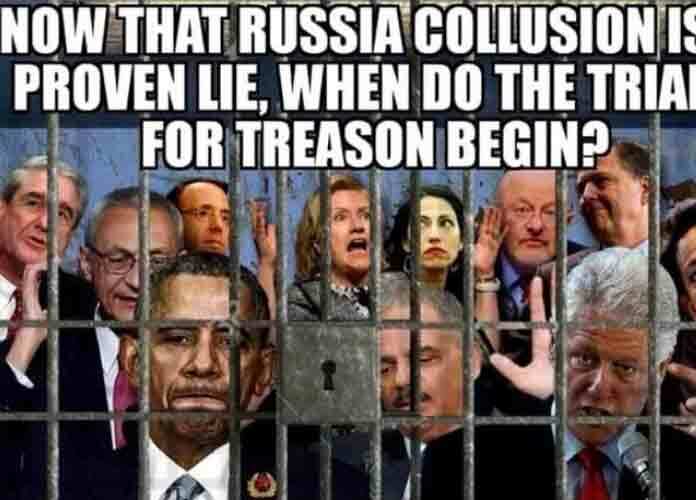 Also depicted behind bars in Trump’s meme were several other famous critics of the president, both liberal and conservative, including Mueller, former FBI Director James Comey and former Attorneys General Loretta Lynch and Eric Holder. Trump has routinely deflected allegations of his and his 2016 campaign team’s contacts with and collusion with Moscow by accusing Democrats like the Clintons of being the ones with ties to Russia. Mueller’s team has already indicted several Russian individuals and organizations and produced guilty pleas from multiple Trump associates since the inquiry began last year. The New York Times also recently revealed Trump wanted to order the Justice Department to prosecute Hillary Clinton and Comey. In January, Trump called Democrats “treasonous” for not clapping during his State of the Union address. The president is especially incensed this week after it was revealed his former campaign chairman Paul Manafort violated his plea deal by continuing to lie to federal investigators. On Thursday morning, Trump’s former personal lawyer Michael Cohen also pleaded guilty to lying to Congress about a prospective Trump Tower deal in Moscow in 2016. Trump also called Mueller a “conflicted prosecutor gone rogue” on Twitter Tuesday.